Shahi Paneer is a dish fit for a king. 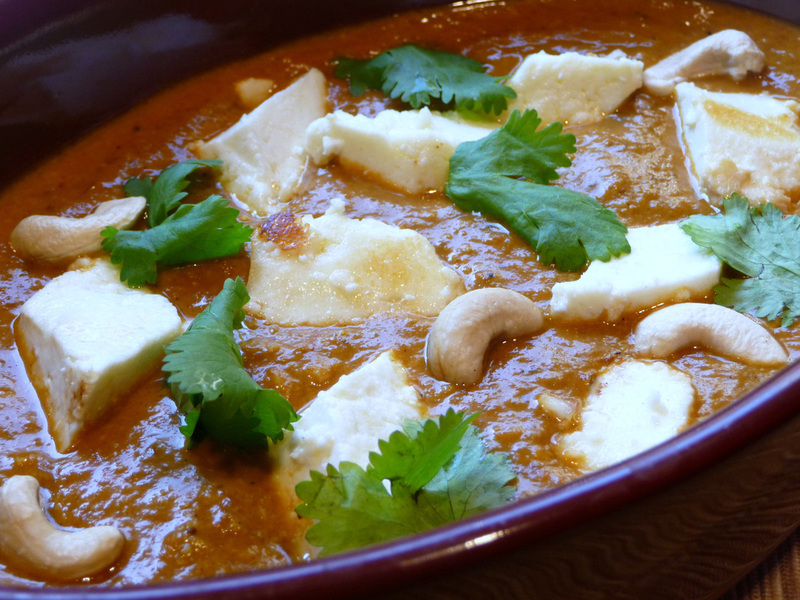 Paneer, homemade cheese, is cooked in a rich and creamy sauce made from cashews. Try this delectable and flavorful Indian dish that is also a restaurant favorite. 1. Soak cashews in milk for 15 minutes. 2. Meanwhile, heat 2 tbsp oil in a pan on medium to high heat. 3. Add onions and cook until translucent. 4. Add ginger, garlic, green chilies and cook until onions are golden brown. 5. Add tomato sauce and stir well. Cook until oil separates from the mixture. 6. Blend soaked cashews and milk until smooth and keep aside. 7. To the cooked onion/tomato sauce mixture, add cumin powder, coriander powder and garam masala. Mix well. 8. Add blended cashews and milk and mix until there are no lumps in the gravy. 9. Add water, salt and sugar and bring to a boil. 10. In a separate pan, sauté paneer in 1 tbsp of oil on medium to high heat until light golden brown. Remove onto a paper towel lined plate. 11. Once gravy comes to the boil, add paneer and mix. 12. Garnish with fresh cilantro or with additional broken cashew pieces.